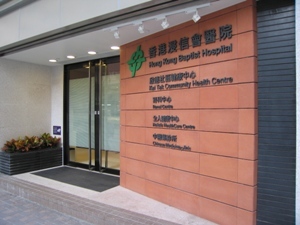 Hong Kong Baptist Hospital has established the new Kai Tak Community Health Centre (KTCHC) at Sung Wong Toi Road, Tokwawan, Kowloon. The Centre is comprised of the Community Clinic and Renal Centre. It provides a full-spectrum of diversified medical services to patients in need in the local community. The Centre means a big step towards materialising the Hospital’s long-term vision of “In the Service of Man”. Since July 2017, the Community Clinic serves the nearby citizen together with the patients from “General Outpatient Clinic Public-Private Partnership Programme”. Targeting patients who are clinically stable, and those with hypertension and/or diabetes mellitus (with or without hyperlipidemia), the Programme aims to provide quality community clinic service to them. The clinic provides good quality service at a relative low cost. Elderly Health Care Voucher is accepted in the Clinic. Currently, the clinic offers general outpatient service, consultation and simple wound care. The Renal Centre in KTCHC is the first community haemodialysis centre operated by Hong Kong Baptist Hospital. The Centre is equipped with 20 sets of state-of-the-art haemodialysis machines to provide haemodialysis service to both local and overseas patients. The haemodialysis machines are not only equipped with auto-priming functions, but also with centralised systems, which allow nurses to monitor the operation of all machines at anytime. The Renal Centre is also equipped with two sets of high-quality Central Water Treatment Systems, which work together with thermal sterilisation to offer high level of safety for patients. Besides the dialysis equipment, each bed is also furnished with individual LCD TV and internet service to ensure a comfortable environment for patients during treatment. Furthermore, the Hospital also provides pastoral care to patients to take care of their psychological health in one go. The Hospital estimates that the new Renal Centre can serve 120 end-stage renal failure (ESRF) patients with 12,000 treatments annually. In order to promote the service to a wider pool of patients, the Centre has also joined the “Haemodialysis Public-Private Partnership Programme put forward by the Hospital Authority. 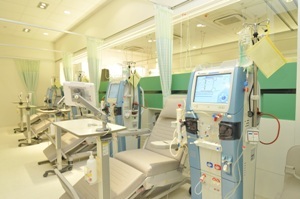 ESRF patients currently receiving treatments from either public or grant hospitals can thus enjoy haemodialysis service provided by the Centre. By joining this programme, more patients can be benefited from the low cost treatment option and quality service. With such, the Hospital can effectively give back to the society and further fulfill its corporate social responsibility.